Post-race protest demotes MX1 rookie to fourth at the penultimate round. 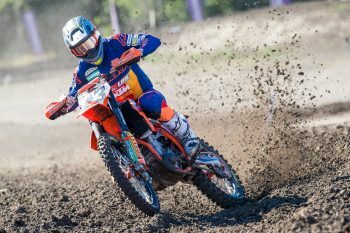 Raceline Pirelli KTM ace Mitch Evans says he disagrees with the penalty that was handed to him following the final moto of Gladstone’s Pirelli MX Nationals in Queensland that ultimately stripped him of a runner-up result. Despite celebrating what was thought to be a second place finish on the podium, a successful protest against Evans at the conclusion of racing for passing on a yellow flag saw him demoted two positions, repositioning him fourth for race two while also placing him fourth overall for the day. The penalty meant Brett Metcalfe (Penrite Honda Racing) was promoted to second followed by youthful Queenslander Caleb Ward (Davey Motorsport Husqvarna) in third, who missed out on celebrating his maiden premier class podium on the box. “I was docked two positions for passing a lapped rider under a yellow flag over the double section,” Evans explained to MotoOnline.com.au. “I disagree with the decision, but it is what it is. As we got to the first yellow flag I was equal with the lapped rider – we were side by side – and as we’ve gone over the jump he went to the outside and I went to the inside and we passed the incident. “That’s when I got around him, but the rule is from flag point to flag point. I was super happy with the weekend though, I got two good starts and got second in Super Pole – I don’t know how many times it’s been that I’ve been pipped for the win. I was really happy with my riding and I was strong towards the end of both motos. Queensland’s Evans still holds down an impressive second in the championship standings by a mere five points as the final round looms this weekend at the popular Coolum venue on the Sunshine Coast.